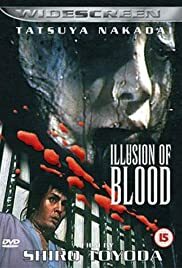 While the US were pounding out wall to wall Westerns, Japan (Most notably Toho) were making Samurai movies from epics to action films to horrors like Illusion of Blood. Based on a tale that had been adapted many times before it tells the story of a samurai tormented by the death of his ex-wife which he had part in. Gradually he begins to lose his mind as he is besieged by haunting visions. I can only hope that the other adaptations of the tale are better because in no way did I appreciate this one. It failed to engage, the story is a mess and engulfed in side plots that ultimately contribute little. Tatsuya Nakadai leads, a man I found obnoxious as the antagonist of Sanjuro (1962) but that's what they were going for. Here he's just annoying, it's hard to dislike a character when you simply can't find it in yourself to care. The visuals are strong, the performances are passable but the story was shoddily told. Even a studio like Toho can drop the ball sometimes, but based on the rating I can appreciate I'm in the minority thinking this.